Well, it’s been a busy couple of weeks. The first piece of good news is that I’ve just finished the draft of The Zero Equation, which is the third and final novel in The Zero Enigma. There will be other stories set in the same universe – perhaps including some written by other authors – but this is the end of the first trilogy. I think TZE will be coming out in mid-Feb, but it depends. The second piece of good news is that The Promised Lie will be coming out shortly from Elsewhen Press. It’s the first in a planned trilogy of books set in the Bookworm universe, but I’ve worked hard to make it look and feel very different. (If only because the post-Full Circle universe has been changed radically.) I hope you enjoy it. The third piece of good news is that Alassa’s Tale has been doing reasonably well on Amazon Kindle, even though it’s a novella. (If you buy paperbacks, I think Alassa’s Tale will be included with the paperback of The Princess in the Tower.) Obviously, this has encouraged me to plan more short stories in the same universe. I’ve only got a plan for one so far – Gennady’s Tale – but there will be others. I’ve also been messing around with plotlines, as I plan to do another trilogy later in the year. One thought is a rewrite of The Remnant, in which future-Earth has been occupied by the aliens, but a handful of ships survive to plot revenge. Another is a story based around homeschooling magic kids – which grew out of a discussion about what sort of magic stories we hadn’t seen – although I’m still working on the details. I also plan to plot Book 15 of The Empire’s Corps, which will kick off the next big saga in the series – back in the core, this time, instead of somewhere on the edge. Which ones would you like to see first? The first Schooled In Magic novella! 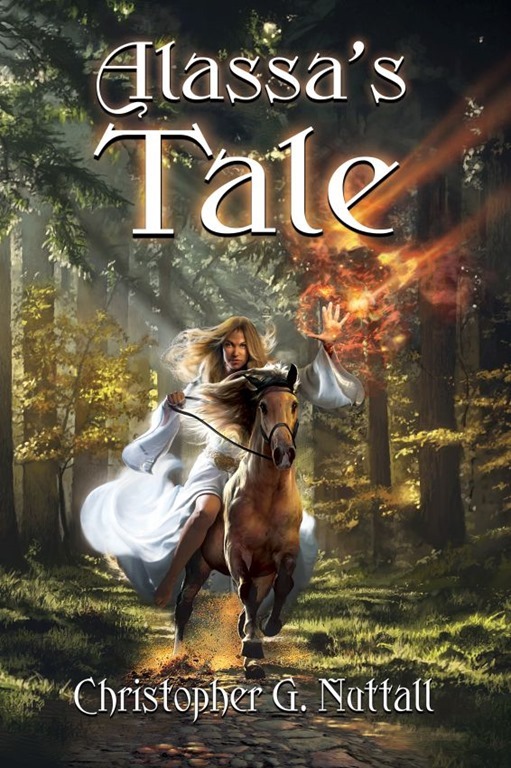 First, we now have a cover for Alassa’s Tale, so I’m hoping that the eBook will be released within the next few days. There probably won’t be a specific paperback release for the novella, as it’s only a quarter of a regular book, so we’re currently planning to include the novella in the paperback version of The Princess in the Tower. We may end up doing the same for the audio version, but that’s some time off. I’ll keep you informed. Second, the remaining books in The Empire’s Corps are now available in paperback, purchased through Amazon. 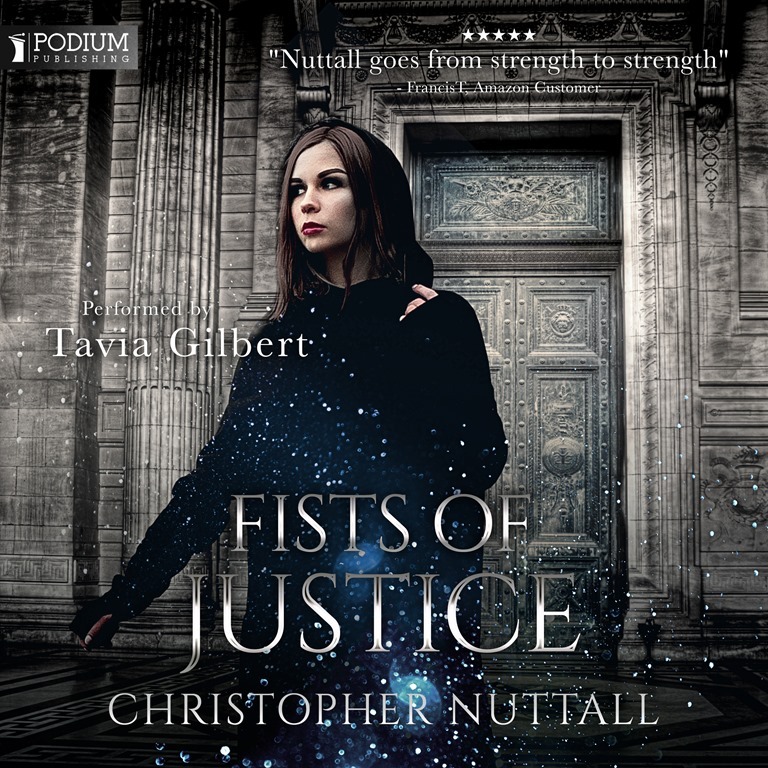 Third, Fists of Justice is planned for an audio release on Feb 15. And fourth, I’m currently sixteen chapters into The Zero Equation. I’m hoping for a release date somewhere in late February, as the books have always had an extensive editing process, but obviously that cannot be confirmed at this time. I awoke, to a soft insistent tapping on the other side of my drapes. I looked up and winced, again. Rose looked pale, so pale that her red hair was more striking than usual. She’d been having nightmares, I knew; nightmares that had left her feeling as though she hadn’t had any sleep at all. I was surprised that Sandy hadn’t insisted that Rose sleep somewhere else, if she wasn’t going to take anything to help her rest. Or, perhaps, attend counselling with Magistra Haydon. My father had offered to let Rose speak with one of the family’s experts on mental health, but that would have to wait until after the hearing. I didn’t think she’d enjoy it very much. But she might need it, I thought. I’d had problems with the shrinks – they’d assumed that I was deliberately repressing my magic, the magic I didn’t have – but Rose was a far simpler case. They might be able to help her. I slung my bag over my shoulder, then stepped through the drapes myself. The other beds were empty, suggesting that our dormmates had gone down to breakfast or found something else to do with their time. Sandy might have chased them out, I supposed. Normally, weekends were lazy days … even with exams coming up. But no one would argue with Sandy when she was in a bad mood. I’d heard that she’d received a tongue-lashing for letting Rose, Akin and myself be kidnapped. It wasn’t her fault, but I knew the staff were in desperate need of someone to blame. Sandy shrugged, then lay back on her bed. I hesitated, trying to think of something to say, but none of the etiquette lessons Mum had forced me to take had covered this situation. Sandy hadn’t made a fool of herself, unlike a few upperclassmen I could mention, nor had she been deliberately malicious … and yet her future had been ruined anyway. No one would want to offer her an apprenticeship now. I wished there was something I could do for her, but nothing came to mind. My father was hardly likely to listen to my pleading on her behalf. I felt oddly exposed as I walked through the door and down the corridor. My hair hadn’t been washed, let alone braided. Mum would have pitched a fit if she’d seen us, even though there was no reasonable chance of being seen by the adults. And if I was seen … I’d be the talk of the town, not in a good way. There were just too many people who wanted to embarrass our house. They’d gleefully dissect my etiquette failings for the rest of the year. Not that it matters, I thought. They spent the last three years dissecting my failures in magic. The familiar bitter resentment welled up inside me as we reached the changing room and stepped inside. I’d had no magic – no apparent magic – for six years, while my siblings had developed their magic at a terrifying rate. Even now, even after discovering what I could do, I still felt a little resentment. The kidnappers – Fairuza and her mystery patron – had treated me as an object, rather than a person. And too many others felt the same way. They were more concerned with what I could do for them than what they could do for me. I tensed, automatically. Alana had been my tormenter for six years, regularly hexing and jinxing me for her own amusement. Our relationship had never been pleasant. Even now, I was wary of her. She’d veered from regarding me as a ball and chain around her future prospects to fearing that my unique talents would allow me to outshine her. Dad might have ordered her and Bella to help us prepare for the hearing, but … I hoped she’d have the sense to behave herself. Dad was on the warpath. I looked from Alana to Bella, then shrugged. It was hard to believe, sometimes, that we were really related. We had the same eyes and skin tone, but Alana’s face was sharper than mine while Bella’s had grown pudgy. They took more after Mum than Dad, something I supposed was lucky for them. I had inherited his cheekbones. Mum had told me that I’d grow into my looks, but I rather suspected it was the kind of thing mothers told their homely daughters. Rose followed me into the shower. She looked as nervous as I felt, even though she knew she needed Alana and Bella more than me. I could braid my own hair, given time. I could even devise Objects of Power to help me braid my hair. But Rose had grown up in the countryside. Everything she said, every move she made, marked her as someone of no account. She needed to be dressed properly, if nothing else, or she’d be dismissed as hopelessly gauche. I shook my head. If I’d grown up on a farm, no one would have thought there was anything odd about my lack of magic. But it wouldn’t have been an easy life. Rose had told me enough horror stories about life on the farm to convince me that it wasn’t something I wanted for myself. And yet … I wasn’t sure what I did want. I’d wanted to be famous – and now I was famous – but it had come at a price. My life would never be my own. Rose muttered a drying cantrip as we stepped out of the shower and back into the changing room. Alana and Bella had been unusually efficient; they’d set up the dressing tables and hung the dresses behind the door, rather than leave them in the bags until they were actually needed. I hesitated, unwilling to let Alana any closer than absolutely necessary, then sighed and nodded to the dress. Better for Bella to work on Rose than risk Alana hexing my friend when her back was turned. I didn’t think Alana would be stupid enough to anger Dad that badly, but she’d done stupid things before. Bella made a small sound of protest. I winced in sympathy. Bella wasn’t exactly overweight, but she was pudgy enough for it to be noticed. Thankfully, she had the patience to help Rose don unfamiliar undergarments. I didn’t know what Rose had worn on the farm, but I was fairly sure it was something simple. She’d had a great deal of trouble with the school uniform when she’d first arrived. I’d had to help her get dressed more than once. I ignored her as I studied the blue dress. It was a miniature version of a dress Mum wore on special occasions, right down to the runes sewn into the silk and the family crest on my left shoulder. No one would fail to recognise me. Alana helped me into it, tightening fastenings and doing up ribbons. I tried to keep the dismay off my face as I inspected myself in the mirror. The dress looked nice, but it wasn’t designed to be easy to remove. I was going to have real problems when we returned to the school. Alana shook her head, hastily. I hid my smile as I sat down in front of the dressing table and braced myself. Sisters braided each other’s hair all the time, I’d been told, but I wasn’t too keen on allowing Alana anywhere near my hair. She’d once hexed my barrette to fall out at a particularly embarrassing moment, which would have been bad enough, but it had somehow undone my braids at the same time. Mum had been furious. Alana had been lucky not to be grounded for so long her grandchildren would still be stuck in the bedroom. I had to smile. That had been a very peaceful summer. I shivered. Akin was going to be there – and so was his father. Lord Carioca Rubén had been working steadily to undermine my father’s position since they were both young men. Akin had told me that Carioca Rubén had been delighted when it had seemed I didn’t have magic, then horrified when he realised the truth. It would be hard, almost impossible, for us to be unseated if we were the only source of new Objects of Power. Dad had wondered if Carioca Rubén had backed the kidnappers, even though he’d sworn an oath denying it. They had every reason to try to remove me before my mere existence shifted the balance of power permanently against them. And we have their Family Sword, I thought. I’d hidden it under my bed, locked away in a box I’d designed myself. I didn’t know if Akin had told his father about the sword. I knew I hadn’t told my father. That won’t make our lives any easier. “Thank the ancients,” Alana said. I groaned. Weddings were hard enough at the best of times. But a match between a Great House and a New Man? They were always awkward. The Great Houses understood the importance of new blood, but there was always someone who would look down on the newcomer. And there was probably no way to get out of it, if we were invited. Mum and Dad would make us go. “I’ll try to come up with an excuse,” I said. Rose giggled. She clearly thought Alana was joking. I knew better. Weddings were the social event of the year, as far as the families were concerned. Anyone who didn’t attend would be deemed to have snubbed the families, something that would have thoroughly unpleasant repercussions further down the line. I’d heard enough horror stories to know that a feud that started at a wedding would linger for centuries, long enough for everyone involved to forget what actually started it. I looked at my reflection. The braid was perfect, not a single hair out of place. Alana had placed a couple of clips into the hair to hold it firmly in place, but I doubted they were necessary. She’d done a very good job. The blue dress looked striking, although I had the feeling it was going to get crumpled by the time we reached Magus Court. Thankfully, the family dressmaker had charmed the material to ensure it didn’t get rumpled – or dirty. Those charms might not last, I reminded myself. I’d discovered that charms fed off a magician’s personal magic, but – as far as I knew – Rose and I were the only people who knew it. And I was the only person who knew the source of magic. The dress might start getting dirty halfway through the hearing. I glanced at Rose. She looked as if she didn’t dare to move. The green dress my parents had sent her was expensive, very expensive. My family could afford a hundred such dresses and never notice the cost, but Rose’s family could no more buy silk from Hangchow than they could purchase an Object of Power. If she tore it … I shot her a reassuring look. The dress was charmed to keep it intact and Rose, unlike me, had plenty of raw magic to power the spells. She wouldn’t be able to damage the dress unless she used a pretty destructive spell. I felt my stomach growl, so I took a sandwich and ate it quickly. It tasted like ashes in my mouth. We were going to Magus Court … the butterflies in my stomach were multiplying at terrifying speed. Normally, I wouldn’t visit the court while it was in session, at least until I was old enough to have my Season. A mistake made in front of everyone who was anyone would haunt me for the rest of my life. Alana would spend the rest of her life rubbing it in. “Thank you,” I said, sourly. I opened my bag and removed a pair of protective bracelets, glinting under the light. I slipped one onto my wrist and passed the other to Rose. Magus Court was supposed to be protected against all threats, from subtle mind-altering charms to outright death spells, but I knew better than to place my faith in Devices of Power. Too many magicians would be working hard trying to find ways to circumvent the wards. Even Objects of Power could be beaten if one knew how to do it. And I can’t even sense magic, I thought, as I snapped the earrings into place. I’m vulnerable. There was a sharp rap at the door. Alana opened it. I was chatting with another writer about the possibilities of a crossover between her series and The Zero Enigma universe. This is written from an outside POV, so it won’t be included at the back of book III. It is not actually clear if the natives of World-CGN-4832 are human or not. They are very definitely close to baseline human, to the point of being sexually compatible with outsiders, but there are a number of significant differences. The most significant of these differences is the chakra organs, present within their bodies. X-rays reveal that the average native of Allrianne possesses three to five such organs, with the uppermost one located just below the brain. These organs appear to have evolved to feed off the high-energy reality-distorting field surrounding the planet, allowing the natives to absorb and redirect the energy at will. They call it magic. The magic field’s presence makes it hard to conduct a proper examination on site (all technology above Level C seems to fail very quickly) but a number things can be said with a reasonable degree of certainty. The chakra organs appear to function in a manner comparable to muscles, allowing even people with low magic sensitivity to develop their inherent power through constant practice. It is clear that even the lowest sections of society can produce powerful ‘magic-users.’ The presence number of chakra organs may determine one’s inherent power, as muscles determine strength, but exercise and training can allow someone to even the odds. It is possible that constant flexing of the chakra organs leads to the body automatically evolving additional organs. The limitations placed on opening direct contact with the natives makes it hard to study the more powerful magicians. That said, it is clear that the chakra organs require the steady presence of the magic field to function correctly. The locals are unaware of this, but they do not actually possess any inherent power of their own. Their bodies act like batteries, storing magic; their powers simply fail, it seems, when they are separated from the field. The handful of volunteers we invited to cross the gate lost their powers very quickly. (This had the advantage of allowing us to conduct the x-rays mentioned above.) Physically, they were practically baseline humans with some additional DNA. However, we believe the chakra organs will manifest in any children sired or born by the emigrants. They appear to be dominant. This isn’t too surprising, given the effect magic has on their society. Everyone has some level of magic, as far as we can determine. Non-magic users must have been out-evolved thousands of years ago. Conscious control of magic may have come fairly recently – the handful of history books we discovered suggest that magic’s principles were discovered only two thousand years ago, an eyeblink compared to the length of human evolution – but it is clear that unconscious usage of magic was in existence well before then. In particular, the magic may boost the body’s immune system and assist it to recover. It’s also notable that a magician may release a burst of uncontrolled magic when frightened or angry, protecting he magician from attack. Women have been recorded losing control of their magic and killing would-be rapists. It’s particularly notable that their society embraces a far greater level of sexual equality than many other societies at their apparent level of development. Our attempts to study magic were quite limited. It was fairly easy to work out potential spells by running spellbooks through the supercomputers, but impossible to cast them without the chakra organs. We were unable to do more than get a few basic readings when our volunteers tried to cast spells in the testing chambers. Their magic simply dissolved within seconds of release. (It’s possible that it started to fade into the background as soon as they stepped through the gate.) We did attempt to convince volunteers to cast spells on their side of the gate, but results were very limited. Their ability to cast spells was limited too. There were some oddities. Allen, Penny and Sam all volunteered to have spells cast on them. Their experiences were odd, to say the least; Allen, turned into a frog, reported that his mind appeared to understand his new body even through it was obviously not human. Penny, turned into a statue, reported that the experience felt oddly numbing. She didn’t panic, as she noted, because she felt she couldn’t panic. At some level, being stone felt natural. Sam was the only one who reported that her experiences were thoroughly unpleasant, perhaps unsurprisingly. Compulsion spells were cast on her. It is impossible to be sure, of course, but we believe that, in the case of Allen and Penny, that their minds automatically adapted to their new bodies. Destroying a mind is apparently a great deal harder, although death spells are seemingly common. Sam’s mind was actually warped, to some extent; she felt that the spells were an intrusion, rather than anything more benevolent. Further research is clearly required. In all cases, the spells wore off almost as soon as the volunteers were taken back through the gates. The force holding the magic in place simply faded once the victims were removed from the magic field. This appears to be true of spells cast on local victims too; they simply don’t last forever, unless held in place by magic artefacts. The locals do not seem to regard magic as anything unearthly or even supernatural. It just is. It is important to remember, I think, that Allrianne is not a primitive world. It’s inhabitants have evolved a social structure that allows them to examine the world around them and learn how to control it. They have the scientific method, although they study magic rather than science. To them, magic is science. They may not be able to build gateway generators, but I wouldn’t rule out them finding some other way to cross dimensions. It’s hard to see how we should proceed, too. Allrianne can teach us a great deal about the nature of reality, with a ready-made alternate way of looking at the universe. However, it will be immensely difficult to infiltrate their society in the short term. None of our people have the chakra organs and, therefore, will be unable to fake magic. Worse, the limits of technology make it impossible to conceal this. Sending an agent into one of the bigger cities will mean running a tremendous risk. We are unable to use magic – or to defend against it. In the long term, we might be able to splice chakra organs into clone-bodies and transfer mind-patterns to them, but it is unclear if that is possible. Our clones will not grow to adulthood, but emerge fully-formed. It may not be possible to control their magic; indeed, we don’t know if the chakra organs will absorb power if they’re not touching the magic field from the very start. There are just too many unknowns. I leave it up to you, sir, if we should attempt to make open contact. It is probably better to look at the Great Houses as clans, rather than families. They are immense, even the smallest having over fifty senior members; they wield vast power and influence, at least in part, because they’re a gathering of powerful magicians. Their power (and patronage networks) often stretch well beyond the boundaries of Shallot itself. It’s fairly simple to define a Great House. It must be a large and powerful faction of magicians, one that cannot be ignored by the rest of the city. 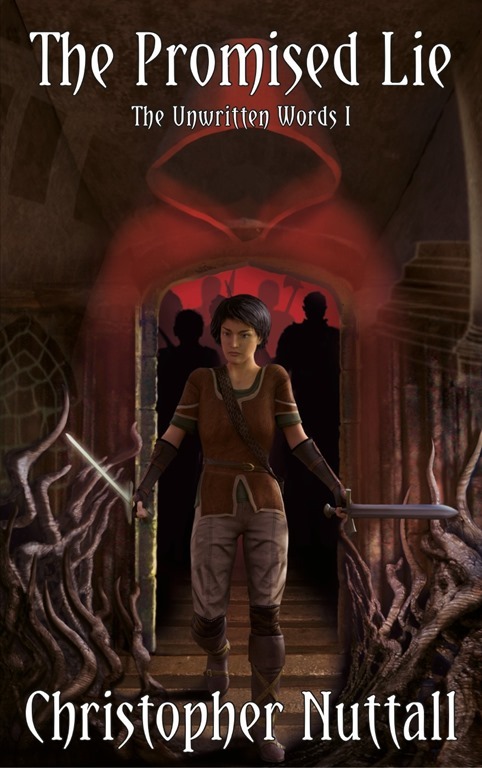 In theory, smaller families and guilds can possess the power of a Great House (and demand seats on Magus Court) but in practice they tend not to have much staying power. A Great House is generally divided into four sections. The greater family consists of the senior members nearest to the core bloodline; the lesser family consists of the senior members further away from the core, the children consist of the underage family members and the clients consist of unrelated magicians who have accepted the family’s patronage and sworn themselves to its service. It is unusual for a member of the lesser family to have any say in the family’s internal affairs, but it has been known to happen; children and clients, of course, do not have any say at all. The typical Great House is led by a Patriarch or Matriarch, who is elected by the family council (the greater family) and serves for life unless the council decides to remove him from his position. A Patriarch wields considerable power over the family, although there are some limits; he is also expected to spend most of his day tending to the family’s affairs, seeing to the education of its children and nurturing the family’s network of clients. It is rare for a Patriarch to change things radically, as most Patriarchs come from the greater family and tend to regard tradition as inflexible. The Patriarch’s day starts with breakfast, which is generally shared with his wife, children and closest relatives. Once he has eaten, the Patriarch will converse with clients or work with his apprentices to further their magical studies a task that consumes most of the morning. A Patriarch will then share lunch with his senior clients (an invitation to dinner is regarded as a great honour) before attending Magus Court (or the lesser law courts) to discuss city law or plead for his clients in a courtroom. Dinner is shared with close family and rarely interrupted; the evening is free. Lesser family members are either trained to serve the Great House (as servants, for example) or encouraged to go into positions that will allow their family to expand its influence. This isn’t necessarily a bad thing: the family butler, for example, wields considerable power in his own right. Others go into teaching, where they tutor the family’s children, or join the family’s private armsmen. The family will also provide the funds for a lesser family member who wishes to open a business or something else that may enhance the family’s position. The family’s children (greater and lesser) receive private tuition in magic from the age of six, as well as an extensive education that covers everything from accident languages to law and family history. A child is expected to be able to recite his or her entire family tree by the time they reach ten, allowing them to position themselves as heirs to ancient traditions. Particularly clever and promising children are singled out for further training, which can be offered privately (and secretly). A handful of children are sometimes dispatched to foreign schools, allowing them to make overseas contacts and keep abreast of magical developments outside Tintagel. As they grow older, children are expected to attend formalised gatherings (and less formal parties) with children from other Great Houses. This allows them to get to know their fellows before they go to Jude’s, while their parents can show off their magical progeny to their peers. Courtly manners are drilled into them, to the point where making a mistake in etiquette can haunt someone for the rest of their life. By law, children are effectively the property of their family (and effectively the family’s clients). The Patriarch has vast authority when it comes to shaping their lives, although wise Patriarchs understand the dangers of being too strict or indulgent. Magus Court (or other outside authorities) do not have the legal power to intervene, if they feel a child is being abused; that said, parents can be (and often are) held accountable for their child’s behaviour. It is extremely uncommon for a family member to either betray the family or simply leave. The vast majority of family members believe in the family, even if they don’t always like it. Many of them wouldn’t know what to do outside the family (and wouldn’t have access to family funds.) Indeed, the Patriarchs often try to help the discontented find a place where they will be happier, rather than forcing them to stay somewhere they’re unhappy. That said, someone who wants to leave completely will often be given a severance package and formally disowned from the family. They will no longer be considered part of their former clan. A person who betrays the family, on the other hand, will be declared outcast. They will have little hope of finding a safe place within the city.